"Life is such a precious gift and I feel grateful for every day that I'm here. I'm vegan because I don't want to contribute to ending the lives of others who want to be here just as much as I do." - Vegan Publishers It is built into being vegan to care about animals, humanity, and the environment, or to at least acknowledge that the suffering and death inflicted upon animals by human beings is destructive and unjust. This is because veganism, as a philosophy of how to live and as a social movement, aims to end animal exploitation. This is what distinguishes veganism from a plant-based diet, which is typically pursued for self-serving health benefits rather than other-serving ethical concerns. Nevertheless, while it's true that veganism by nature involves an ethic of care or a sense of justice, why do vegans become activists? 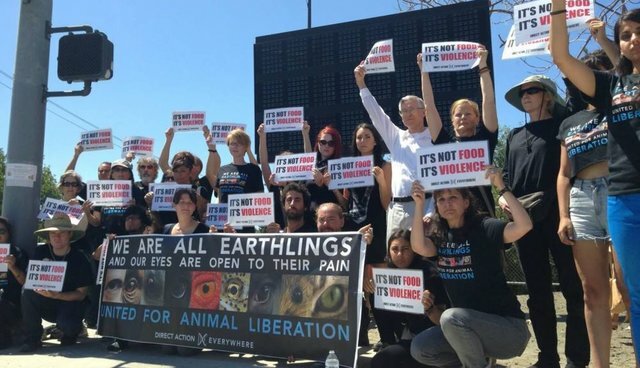 Why does the urge to become active in advocacy follow so readily from becoming vegan? I have come to believe that the need and the calling arise from the profound psychological, or perhaps spiritual shift that occurs when one radically alters one's relationship to other living beings and thus to the world. This transformation is so fundamental that it's near impossible to convey to those who haven't yet experienced it. I vividly remember the afternoon when it swept over me as I read Will Tuttle's The World Peace Diet. I knew that my worldview and way of life would never be the same. It's the uncanniness of the paradigm shift that has led some vegans to say, "don't tell me that you understand why I'm vegan, because if you truly understood, you'd be vegan too." Vegans often speak of feeling inner peace. Some attribute this to no longer consuming the products of fear, suffering and violence, to no longer taking in those violent "vibrations," while others attribute it to the fact that their minds are finally free from the constraints imposed by blocks to their intuitive awareness and compassion and the daily rationalizations required to sustain these blocks. Most of us don't realize just how uncomfortable we are with using animals until we stop. For this reason and others, going vegan is often accompanied by a surprising sense of liberation and relief that we are no longer directly contributing to the unnecessary suffering and death of our fellow earthlings. When we feel the deep gratitude that comes with the fact that no one had to die for us to live, we tend to want to return the favour. It's as though once the cycle of taking beyond our needs, taking the life of someone who wants to live, comes to an end, and that our orientation toward the world fundamentally shifts. This orientation becomes one of gratitude and generosity. When we consume animal products, in any manner and in any quantity, we create and maintain a relationship of imbalance, a dynamic of excessive taking: taking lives, and taking from a resource-intensive industry. Like the child who learns they are "bad" and then proceeds to act unfavorably to reinforce their now instilled feeling of rejection, we tend to reinforce and recreate the dynamic of excessive taking in all areas of our lives. We are already guilty of taking beyond what is necessary, so our actions tend to maintain this dynamic. We're more likely to be apathetic politically, to be less conscientious consumers, to be more selfish in our relationships, to be less mindful in our everyday lives, to lack the inspiration to act in the world and to feel as though what we do doesn't really matter. This is certainly not to say that all non-vegans (or pre-vegans if you're optimistic!) demonstrate these tendencies nor that all pre-vegans cannot feel gratitude or be activists, but that it's worth exploring why veganism so readily gives rise to intense activism. What is the source of the transformation that vegans so desperately want to share with the world? Veganism offers a liberation from this dynamic of taking and from the feeling of an uneasy and unjust indebtedness. Once our very being no longer relies on the suffering and death of other sentient beings, we are released from the feeling of indebtedness that makes us perpetuate indebtedness. As vegans, the feeling of being indebted to the world that sustains us isn't experienced as such. Instead, we are grateful, and gratitude breeds generosity and peace. This is the profound psychological and spiritual shift that takes place through veganism. It is truly wonderful to feel how this world has given me life. It is truly empowering to realize that because my life - this body - is perfectly sustained without death, that my role is to serve life and stand against what stands against life. My purpose becomes quite clearly to end injustice against animals, humans and nature. It's the least I can do.